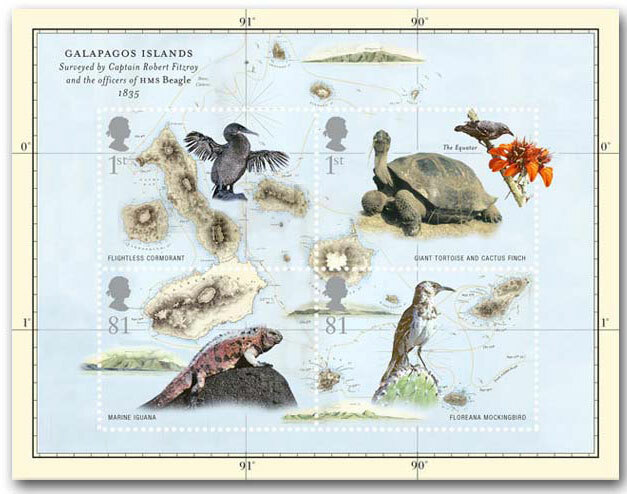 On this date in 1835, HMS Beagle, with Charles Darwin aboard, reached the Galápagos Islands. The ship landed at Chatham, or San Cristobal, the easternmost island of the archipelago. 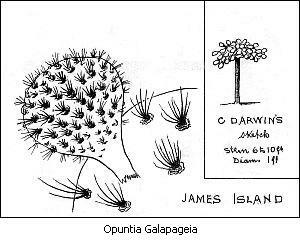 His visit to the Galápagos Islands is justly famous because of the observations he made there that helped him develop the general principles of natural selection. But it is important to remember that he was in the Galápagos for a little over a month on a voyage that lasted five years and circumnavigated the globe. 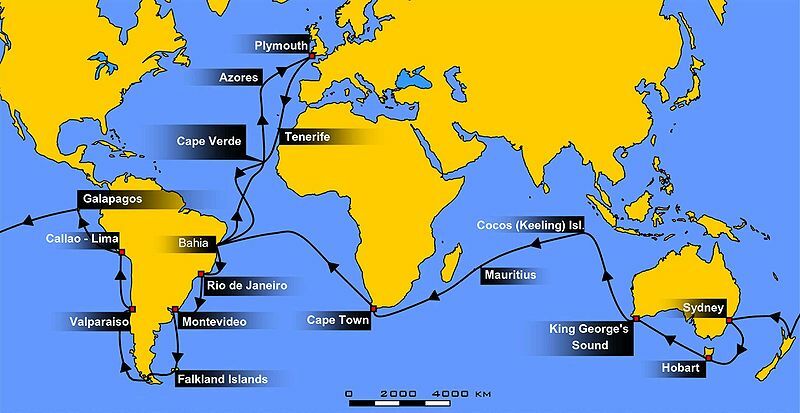 The second voyage of HMS Beagle, from 27 December 1831 to 2 October 1836, was the second survey expedition of HMS Beagle, under captain Robert FitzRoy who had taken over command of the ship on its first voyage after her previous captain committed suicide. FitzRoy had already thought of the advantages of having an expert in geology on board, and sought a gentleman naturalist as a supernumerary who could be his companion while the ship was at sea. The young Cambridge graduate (22 yrs), Charles Darwin, had hoped to see the tropics before becoming a parson, and accepted the opportunity. By the end of the expedition he had already made his name as a geologist and fossil collector, and the publication of his journal which became known as The Voyage of the Beagle gave him wide renown as a writer. I thought it might be appropriate to quote segments from The Voyage of the Beagle concerning the Galápagos rather than describe his visit. A full scan of the first edition can be found here http://http://www.gutenberg.org/files/3704/3704-h/3704-h.htm#chxvii Chapter XVII is the relevant section. The illustrations I am using are partly from the original and partly my own choices. 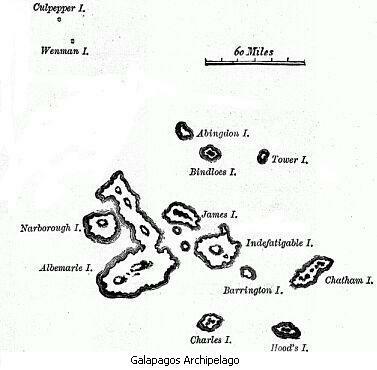 September 15th.—This archipelago consists of ten principal islands, of which five exceed the others in size. They are situated under the Equator, and between five and six hundred miles westward of the coast of America. They are all formed of volcanic rocks; a few fragments of granite curiously glazed and altered by the heat can hardly be considered as an exception. Some of the craters surmounting the larger islands are of immense size, and they rise to a height of between three and four thousand feet. Their flanks are studded by innumerable smaller orifices. I scarcely hesitate to affirm that there must be in the whole archipelago at least two thousand craters. . . . Considering that these islands are placed directly under the equator, the climate is far from being excessively hot; this seems chiefly caused by the singularly low temperature of the surrounding water, brought here by the great southern Polar current. Excepting during one short season very little rain falls, and even then it is irregular; but the clouds generally hang low. Hence, whilst the lower parts of the islands are very sterile, the upper parts, at a height of a thousand feet and upwards, possess a damp climate and a tolerably luxuriant vegetation. This is especially the case on the windward sides of the islands, which first receive and condense the moisture from the atmosphere. . . . In the morning (17th) we landed on Chatham Island, which, like the others, rises with a tame and rounded outline, broken here and there by scattered hillocks, the remains of former craters. Nothing could be less inviting than the first appearance. A broken field of black basaltic lava, thrown into the most rugged waves, and crossed by great fissures, is everywhere covered by stunted, sunburnt brushwood, which shows little signs of life. The dry and parched surface, being heated by the noonday sun, gave to the air a close and sultry feeling, like that from a stove: we fancied even that the bushes smelt unpleasantly. Although I diligently tried to collect as many plants as possible, I succeeded in getting very few; and such wretched-looking little weeds would have better become an arctic than an equatorial Flora. . . . 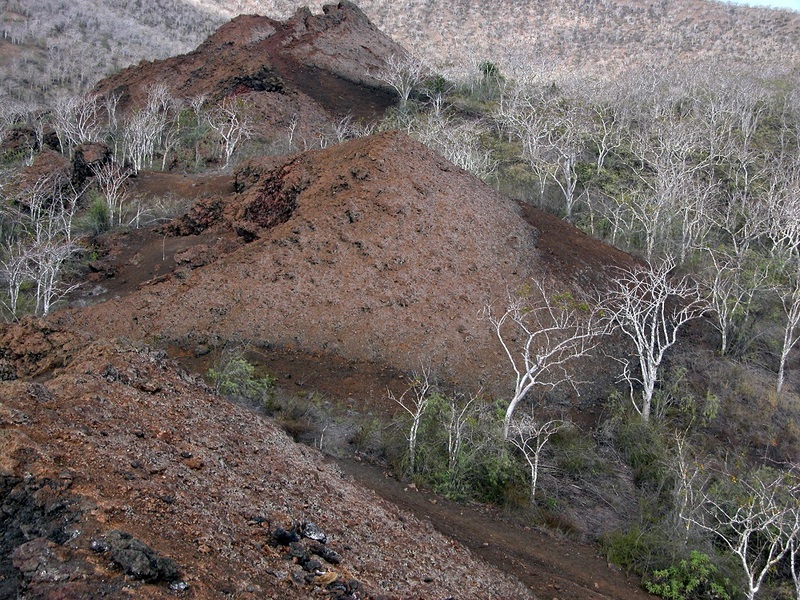 The volcanic island of Fernando Noronha, placed in many respects under nearly similar conditions, is the only other country where I have seen a vegetation at all like this of the Galapagos Islands. . . .
23rd.—The Beagle proceeded to Charles Island. This archipelago has long been frequented, first by the Bucaniers, and latterly by whalers, but it is only within the last six years that a small colony has been established here. The inhabitants are between two and three hundred in number; they are nearly all people of colour, who have been banished for political crimes from the Republic of the Equator, of which Quito is the capital. The settlement is placed about four and a half miles inland, and at a height probably of a thousand feet. . . .The inhabitants, although complaining of poverty, obtain, without much trouble, the means of subsistence. In the woods there are many wild pigs and goats; but the staple article of animal food is supplied by the tortoises. Their numbers have of course been greatly reduced in this island, but the people yet count on two days’ hunting giving them food for the rest of the week. It is said that formerly single vessels have taken away as many as seven hundred, and that the ship’s company of a frigate some years since brought down in one day two hundred tortoises to the beach. September 29th.—We doubled the south-west extremity of Albemarle Island, and the next day were nearly becalmed between it and Narborough Island. Both are covered with immense deluges of black naked lava, which have flowed either over the rims of the great caldrons, like pitch over the rim of a pot in which it has been boiled, or have burst forth from smaller orifices on the flanks . . . The rocks on the coast abounded with great black lizards, between three and four feet long; and on the hills, an ugly yellowish-brown species was equally common. We saw many of this latter kind, some clumsily running out of the way, and others shuffling into their burrows. 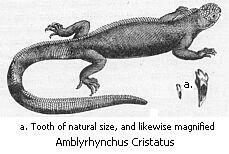 I shall presently describe in more detail the habits of both these reptiles. The whole of this northern part of Albemarle Island is miserably sterile. October 8th.—We arrived at James Island: this island, as well as Charles Island, were long since thus named after our kings of the Stuart line. Mr. Bynoe, myself, and our servants were left here for a week, with provisions and a tent, whilst the “Beagle” went for water. We found here a party of Spaniards who had been sent from Charles Island to dry fish and to salt tortoise-meat. About six miles inland and at the height of nearly 2000 feet, a hovel had been built in which two men lived, who were employed in catching tortoises, whilst the others were fishing on the coast. I paid this party two visits, and slept there one night. . . . While staying in this upper region, we lived entirely upon tortoise-meat: the breast-plate roasted (as the Gauchos do carne con cuero), with the flesh on it, is very good; and the young tortoises make excellent soup; but otherwise the meat to my taste is indifferent. The natural history of these islands is eminently curious, and well deserves attention. Most of the organic productions are aboriginal creations found nowhere else; there is even a difference between the inhabitants of the different islands; yet all show a marked relationship with those of America, though separated from that continent by an open space of ocean, between 500 and 600 miles in width. The archipelago is a little world within itself, or rather a satellite attached to America, whence it has derived a few stray colonists, and has received the general character of its indigenous productions. Considering the small size of these islands, we feel the more astonished at the number of their aboriginal beings, and at their confined range. Seeing every height crowned with its crater, and the boundaries of most of the lava-streams still distinct, we are led to believe that within a period geologically recent the unbroken ocean was here spread out. Hence, both in space and time, we seem to be brought somewhat near to that great fact—that mystery of mysteries—the first appearance of new beings on this earth. 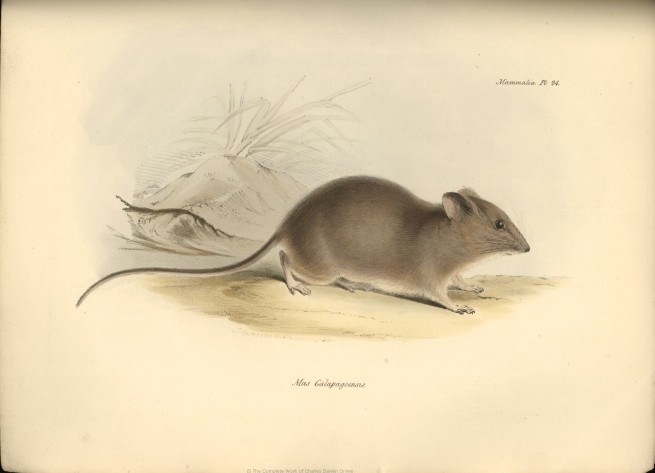 Of terrestrial mammals there is only one which must be considered as indigenous, namely a mouse (Mus Galapagoensis) and this is confined, as far as I could ascertain, to Chatham Island, the most easterly island of the group. It belongs, as I am informed by Mr. Waterhouse, to a division of the family of mice characteristic of America. Of land-birds I obtained twenty-six kinds, all peculiar to the group and found nowhere else, with the exception of one lark-like finch from North America (Dolichonyx oryzivorus) which ranges on that continent as far north as 54 degrees, and generally frequents marshes. . . . 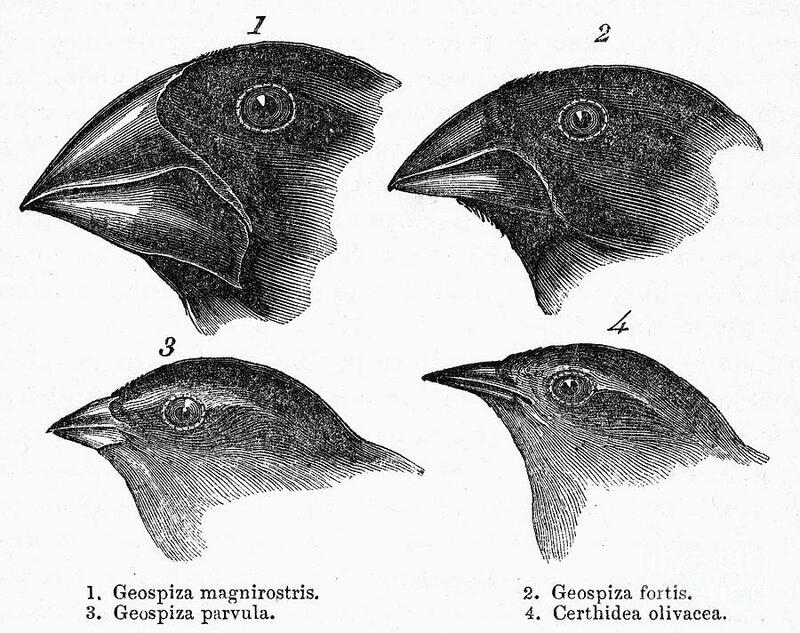 The remaining land-birds form a most singular group of finches, related to each other in the structure of their beaks, short tails, form of body and plumage: there are thirteen species which Mr. Gould has divided into four sub-groups. All these species are peculiar to this archipelago; and so is the whole group, with the exception of one species of the sub-group Cactornis, lately brought from Bow Island, in the Low Archipelago. 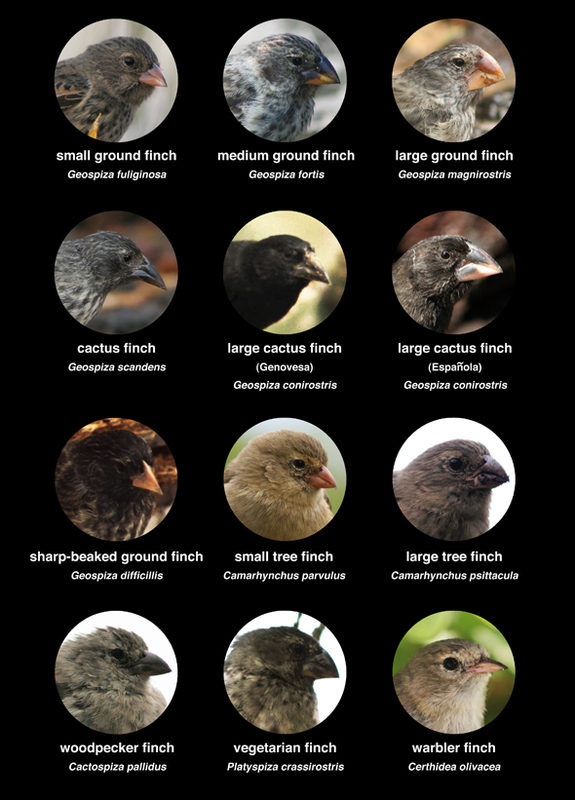 Of Cactornis the two species may be often seen climbing about the flowers of the great cactus-trees; but all the other species of this group of finches, mingled together in flocks, feed on the dry and sterile ground of the lower districts. The males of all, or certainly of the greater number, are jet black; and the females (with perhaps one or two exceptions) are brown. The most curious fact is the perfect gradation in the size of the beaks in the different species of Geospiza, from one as large as that of a hawfinch to that of a chaffinch, and (if Mr. Gould is right in including his sub-group, Certhidea, in the main group) even to that of a warbler. The largest beak in the genus Geospiza is shown above in Fig. 1, and the smallest in Fig. 3; but instead of there being only one intermediate species, with a beak of the size shown in Fig. 2, there are no less than six species with insensibly graduated beaks. The beak of the sub-group Certhidea, is shown in Fig. 4. The beak of Cactornis is somewhat like that of a starling, and that of the fourth sub-group, Camarhynchus, is slightly parrot-shaped. Seeing this gradation and diversity of structure in one small, intimately related group of birds, one might really fancy that from an original paucity of birds in this archipelago, one species had been taken and modified for different ends. In a like manner it might be fancied that a bird, originally a buzzard, had been induced here to undertake the office of the carrion-feeding Polybori of the American continent. The inhabitants, as I have said, state that they can distinguish the tortoises from the different islands; and that they differ not only in size, but in other characters. Captain Porter has described those from Charles and from the nearest island to it, namely, Hood Island, as having their shells in front thick and turned up like a Spanish saddle, whilst the tortoises from James Island are rounder, blacker, and have a better taste when cooked. The distribution of the tenants of this archipelago would not be nearly so wonderful, if, for instance, one island had a mocking-thrush, and a second island some other quite distinct genus;—if one island had its genus of lizard, and a second island another distinct genus, or none whatever;—or if the different islands were inhabited, not by representative species of the same genera of plants, but by totally different genera, as does to a certain extent hold good; for, to give one instance, a large berry-bearing tree at James Island has no representative species in Charles Island. But it is the circumstance that several of the islands possess their own species of the tortoise, mocking-thrush, finches, and numerous plants, these species having the same general habits, occupying analogous situations, and obviously filling the same place in the natural economy of this archipelago, that strikes me with wonder. I will conclude my description of the natural history of these islands by giving an account of the extreme tameness of the birds. This disposition is common to all the terrestrial species; namely, to the mocking-thrushes, the finches, wrens, tyrant-flycatchers, the dove, and carrion-buzzard. All of them often approached sufficiently near to be killed with a switch, and sometimes, as I myself tried, with a cap or hat. 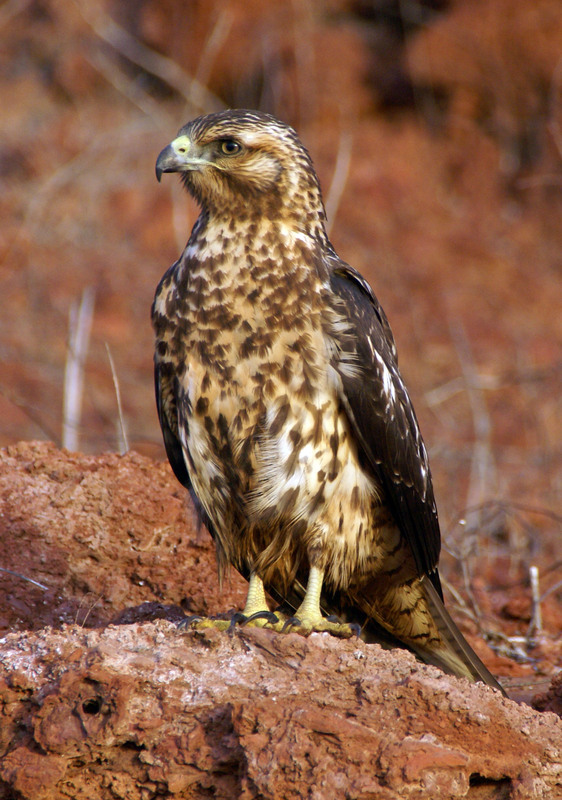 A gun is here almost superfluous; for with the muzzle I pushed a hawk off the branch of a tree. One day, whilst lying down, a mocking-thrush alighted on the edge of a pitcher, made of the shell of a tortoise, which I held in my hand, and began very quietly to sip the water; it allowed me to lift it from the ground whilst seated on the vessel: I often tried, and very nearly succeeded, in catching these birds by their legs. Formerly the birds appear to have been even tamer than at present. These birds, although now still more persecuted, do not readily become wild: in Charles Island, which had then been colonised about six years, I saw a boy sitting by a well with a switch in his hand, with which he killed the doves and finches as they came to drink. He had already procured a little heap of them for his dinner, and he said that he had constantly been in the habit of waiting by this well for the same purpose. It would appear that the birds of this archipelago, not having as yet learnt that man is a more dangerous animal than the tortoise or the Amblyrhynchus, disregard him, in the same manner as in England shy birds, such as magpies, disregard the cows and horses grazing in our fields. Reading his entire description of the Galápagos you will note that Darwin thinks nothing of killing things to study them, as was common in his day. Conservation was not an issue for him. 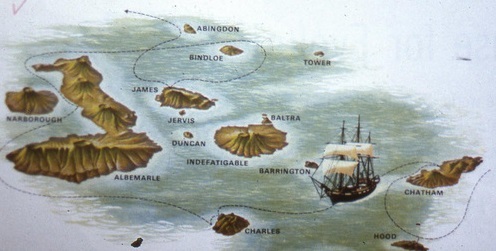 The Beagle set sail for Tahiti on 20 October 1835. Darwin wrote up his notes on board ship, and, as can be seen in these excerpts, was beginning to formulate ideas about the effects of habitats on the forms of species. The bombshell he dropped on the world was some years away, but that is a tale for another time. 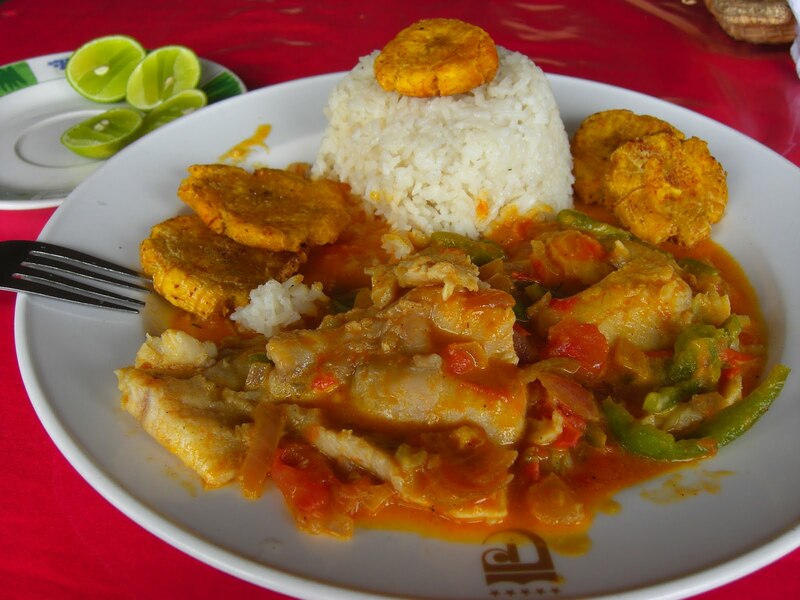 For a recipe I have chosen an Ecuadorean dish of fish in coconut sauce. 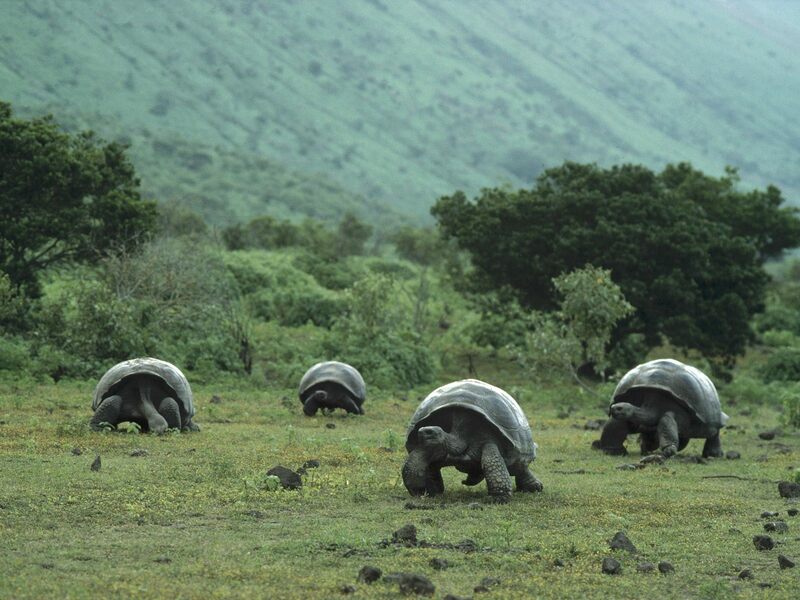 The Galápagos Islands are part of Ecuador now, and it seemed likely to be more palatable than a recipe for tortoise. The preferred fish is halibut which is plentiful all around South America, but any firm white fish will work. You can use a fresh coconut to make the sauce, use both the coconut water and grated coconut flesh. I find this to be a lot of work for an end result that differs little from using coconut milk. It is more traditional, though. Serve with plain white rice and fried plantain chips. Mix the lime juice, orange juice, crushed garlic, cumin, paprika, coriander, and salt in a small bowl. Put the fish in a Ziplok bag, pour in the marinade, close the top with a small hole left, squeeze out the air in the bag, and seal it completely. Let the fish marinate for 1 to 2 hours. Heat the oil over medium heat in a skillet. Add the diced onions, tomatoes, bell peppers, and salt to taste. Sauté for 5 minutes until the vegetables are soft but not browned. Add the coconut milk and heat to a gentle simmer. Cook for about 10 minutes stirring well to avoid burning. Take the fish from the marinade and add them to the sauce. Let everything simmer very gently for about 20 minutes, or until the fish is cooked through. Do not overcook the fish. After 15 minutes you can check by trying to separate one of the chunks with a fork. As a bonus for making it through to the end of the recipe, here is a clip from the end of the movie Master and Commander. 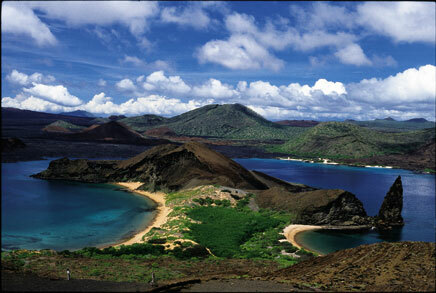 Much of the movie takes place on the Galápagos Islands. The end makes reference to a flightless cormorant that Darwin observed. The final music is a segment from one of my favorite pieces: Luigi Boccherini, la musica notturna delle strade di Madrid. The Spanish subtitles are a bonus.